Today's card was fun to make. It's for my niece who is turning 10 this month. I love the bright colors and the extra touches of gold that those Metallic Enamel Shapes add. I colored the dots on the hat using my Blender Pen and pool of ink on the ink pad lid. I decided to add the metallic stars to the cut out stars, too! I hope you enjoyed looking. Please leave me a comment so I know you were here. 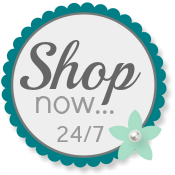 Use my Online Store any time you want to order your own Stampin' Up! supplies. Right now during Sale-A-Bration, you earn on free brochure item for EACH $50 in product you order. There are no limits to the freebies! What a fun & colorful card for any ten-year old!